The Argus, regional newspaper for Sussex, England, in january 2007 had the news first. 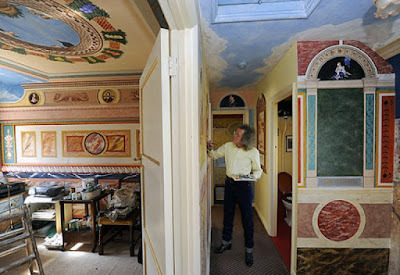 Under the heading Renaissance man's home is his canvas the journal reported about an inhabitant of Brighton and Hove, England, who some years before had begun to decorate the walls and ceilings of his house in renaissance style. 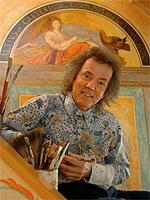 Born in 1948, Robert Burns who grew up in Zambia, at age twenty settled in London, where he worked as a window-dresser. Later in life he went to live in Brighton and Hove in Sussex, where he had a job as an interior decorator. He got married and the couple got four children. Although he never had lessons in art painting, around 2003 at age 55, he began making some paintings on a wall of the family home in the style of the Italian painters of the Renaissance. His wife Linda said she liked his artwork and she encouraged him to keep it up. Burns once had bought a book about art of the Italian Renaissance and had become a fan of these painters and their way of making paintings. So when decorating the interior of his house he mainly reproduced works of Italian painters of the Renaissance such as Botticelli, Corregio and Rafaël, using reproductions in artbooks as an example. When interviewed in 2007 and asked by the newspaper why he had begun decorating the walls and ceilings, he said that this prevented that he would become annoyed when at home in between commissions. He probably also experienced this way of painting as more rewarding than painting the walls of a factory with over fifty litres of magnolia. Burns ultimately decorated all his house, which has three bedrooms, a living room, a sitting room and a kitchen. Begun in 2003 it took him some twelve years to complete it. During these years he got retired, so from that moment on he could spend all his time to doing the decorations. 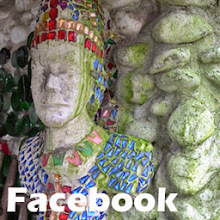 In 2015 the project was completed in such a way, that it could be presented to the British national press and most leading British newspapers like BBC-news, the Guardian, and the Daily Mail had articles about the decorated interior. Burns and his wife do not own the house, but they rent it from the municipality. In general the rule for these houses is that when tenants leave the house, it should be left in it's original state. A spokesperson of the municipality has said however that this rule will not be applied too strictly, depending upon the wishes of the new tenant. Brighton and Hove, South East England, U.K.